You may illuminate this Irish Christmas ornament by inserting a bulb in the opening on the base. This Irish Nativity is in the form of a Christmas ornament that features a shamrock angel standing guard over the Holy Family. 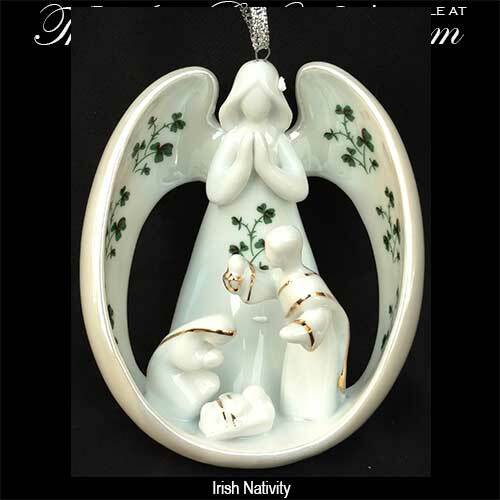 The Irish Nativity ornament is made of white porcelain with green shamrocks and the angel's wings are enhanced with a pearl glaze. 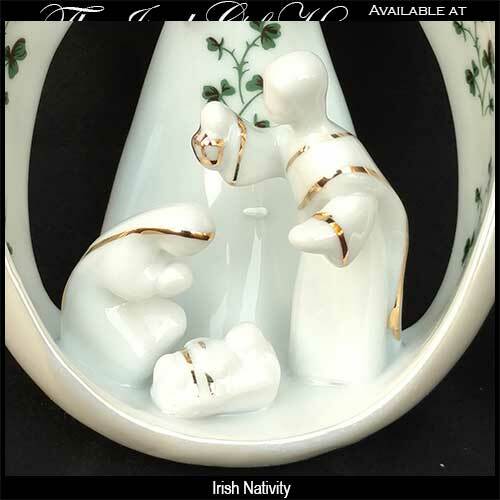 The shamrock Nativity measures 3 1/4" wide x 3 1/2" wide x 2 1/4" deep and it may stand on a table or hang from your Christmas tree with the included ribbon. This Irish Christmas ornament is gift boxed with a shamrock history card, complements of The Irish Gift House.